In a city where Cuban restaurants and bakeries are plentiful, it’s really quite difficult to find one that is truly unique. Finka Table and Tap however is the exception to this rule. This one of a kind Gastro Pub boasts a bold menu with Cuban, Korean and Peruvian dishes. I first heard about this place about a month ago from a friend who said it was a great place to eat. Soon enough I began seeing the restaurant all over Instagram and Twitter and I decided it was time to go. Jessica and I were excited to try this new little spot and here’s what we had. Green Acres – Leblon Cachaça, Fresh Cucumber, Pink Peppercorn Syrup, Lime Juice and Kimchi Flakes. Cuban Old Fashioned – Old Forester86 Bourbon, Bustelo Café Syrup, Angostura and Angostura Orange Bitters. 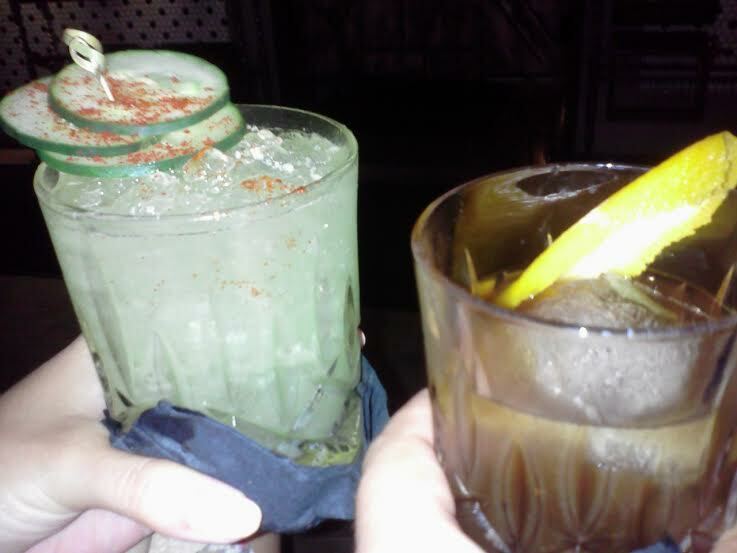 These drinks were a true work of art. Green Acres is an incredibly refreshing drink with the perfect combination of sweet, sour, bitter and smooth. The Cuban Old Fashioned was a very interesting twist on a drink that I love and I would definitely order it again. Mariquitas – Fried Plantains. 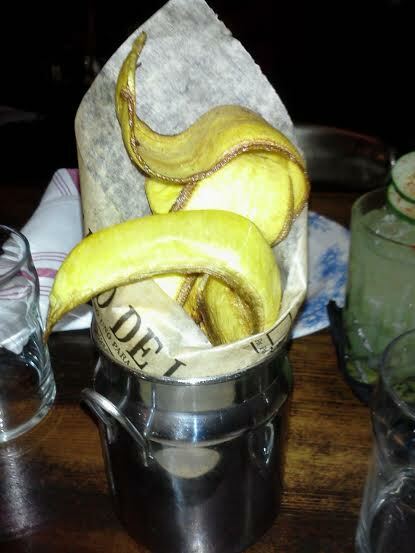 It is typical for Cuban restaurants to serve bread while deciding what to order but not at Finka. These Mariquitas were crunchy and flavorful with a really interesting presentation. We definitely enjoyed these. Croquetas – Fried Ham Pastry and Fried Chicken Pastry. 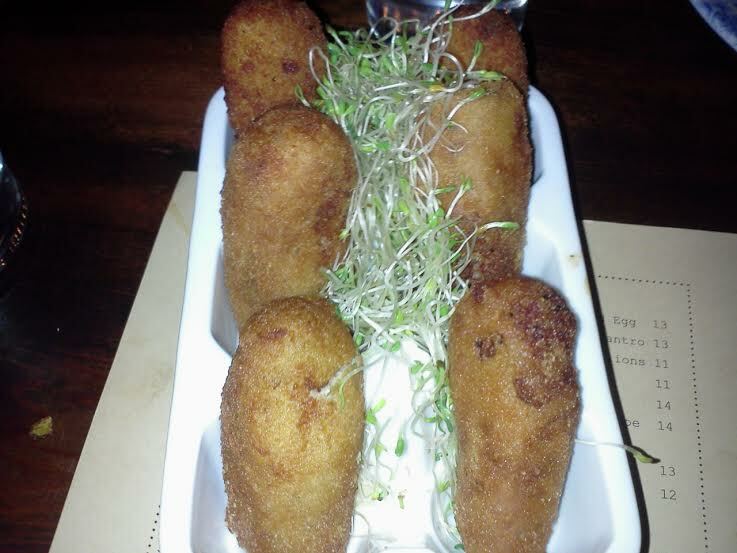 Croquetas are a staple of Cuban cuisine which typically consist of fried ham, chicken or fish. However Jessica and I decided that we would try the ham and chicken Croquetas this time around. These little pastries were cooked to perfection with a crunchy outside and a soft inside served on a bed of alfalfa sprouts. Garbanzos Fritos – Chic Peas, Chorizo, Cilantro and Fried Carrots. What a treat! This little dish is served in a cast iron skillet with the fried carrots on top. Each bite of this exquisite dish was more mouthwatering than the last. I think this was our favorite dish. 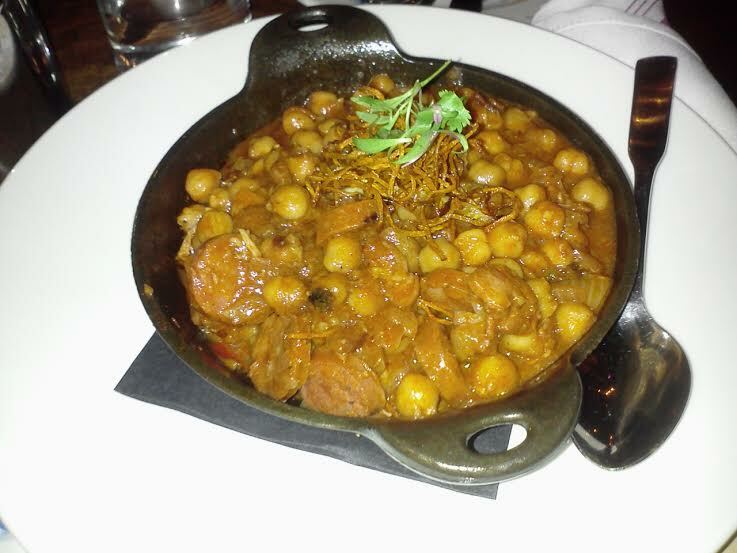 The flavor from the chorizo and the texture from the Garbanzos made this an unforgettable plate. 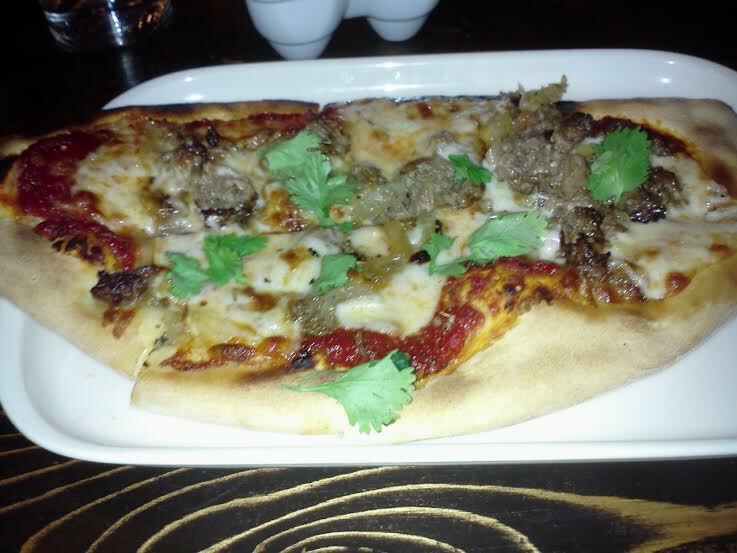 Vaca Frita Flatbread Pizza – Marinated Flank Steak, Cilantro, Caramelized Onions, Mozzarella and Tomato Sauce. This interesting mix was a unique spin on flatbread pizza that I have never experienced before. The Vaca Frita was cooked to a savory perfection while the flatbread kept a hint of its wood oven flavor giving it the perfect taste. A special dish indeed. 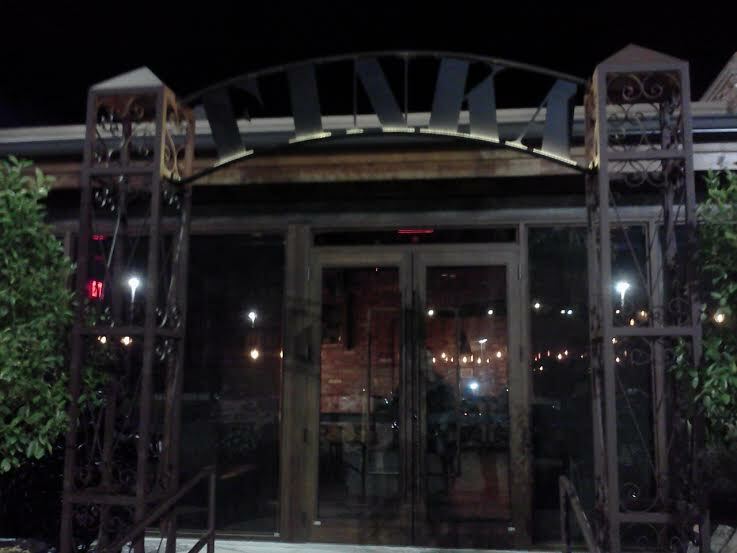 Finka Table and Tap was a great Gastro Pub experience for Jessica and I. This is a place that I will definitely return to in the future. For anyone who likes Cuban food, this place is a must. I hope you all enjoyed the post and thanks for stopping by! Calle Ocho (meaning “8th street” in Spanish) is a famous street in Miami that is best known for its Cuban influence. Leading straight into the heart of Downtown Miami, this street is always buzzing with life and energy. With a Latin vibe that could be found no place else, Calle Ocho is truly unique. However, despite the heavy Latin influence on this street, there is also a vibrant restaurant scene with cuisine from around the world. Instead of going with traditional Cuban food, I wanted to try something a little different. So Jessica and I decided to give Mr. Yum a shot. Best known for its Thai and Japanese cuisine, this restaurant is anything but typical. Here’s what we had. Hangover Soup – Unknown ingredients. So I will confess that when I don’t know all of the ingredients in a dish, I usually look them up on the online Menu after I leave the restaurant. However, this soup is not featured on their online Menu and I have no idea what was in it. 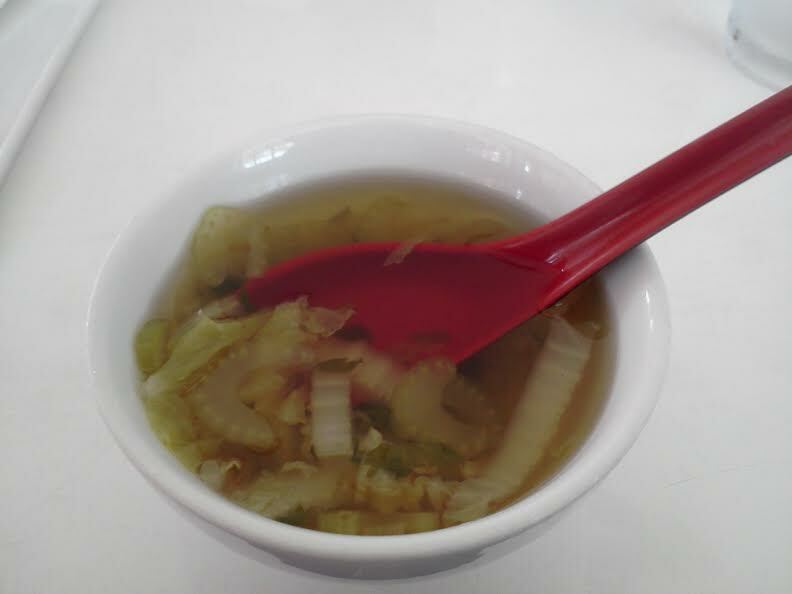 All that I could tell about this soup was that it was absolutely delicious and refreshing with a salty vegetable flavor. Hangover soup is served to you while you’re deciding on your meal. 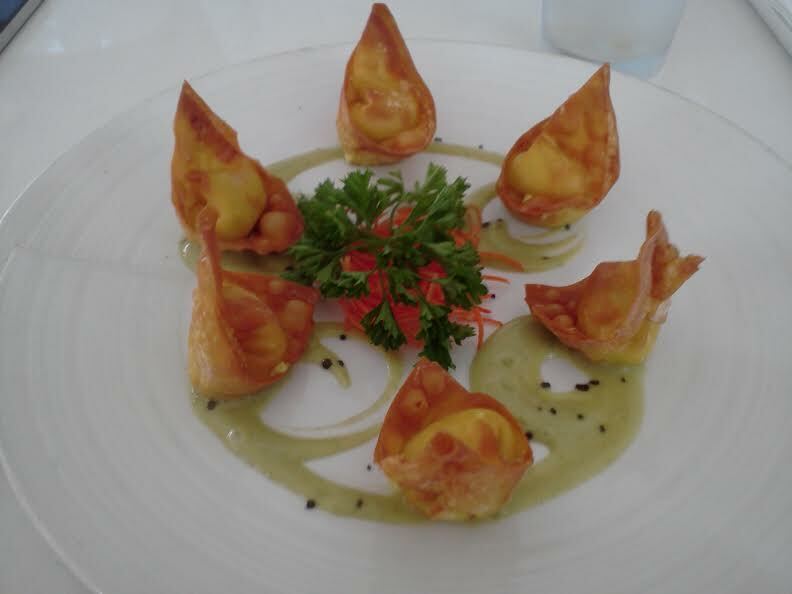 Crab Rangoon – Deep fried dumplings with a curry cream cheese and crab meat center drizzled with an avocado lime sauce. I must say that this was a first time for me. While I’ve had Crab Rangoon in the past, I’ve never had it with a curry cream cheese or avocado lime sauce. What a delicious little treat this was. The curry cream cheese gives it a spicy kick while the avocado lime sauce counter-acts that spice perfectly. This is a great choice for anyone who likes spicy food. 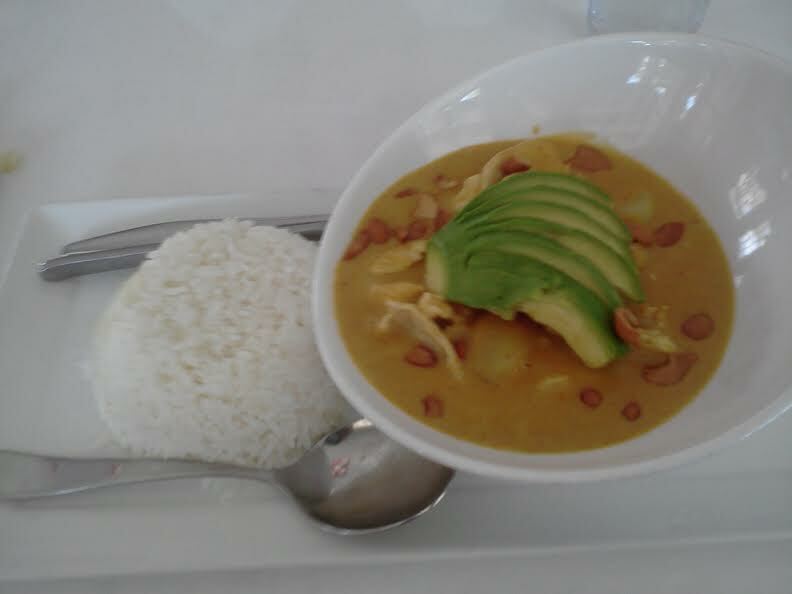 Masaman Curry – Yellow curry with coconut milk, cashews, chicken, potatoes, onions, avocados and a side of white rice. This is the real deal when it comes to curry. Each bite of this amazing dish was both sweet and spicy while also creamy and crunchy. For me, texture can sometimes be as important as flavor and that’s why I loved this dish so much. Fresh avocado slices and just the right amount of kick from the curry made this mouthwatering plate a personal favorite. I would definitely order this one again. 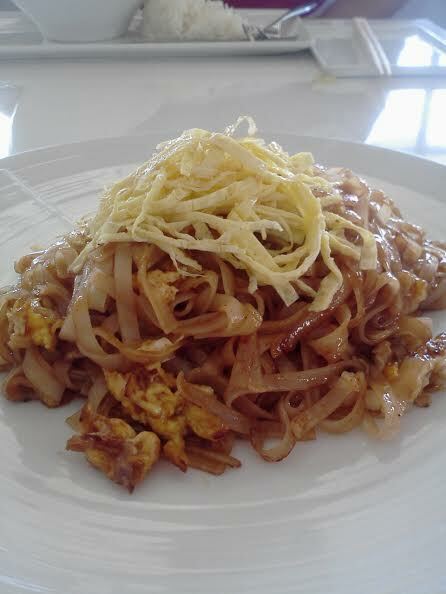 Pad Thai – Sautéed rice noodles, eggs, scallions, bean sprouts and ground peanuts. Jessica ordered this one and I must say that I loved it too. Again, this restaurant knows how to deliver on both flavor and texture. The noodles were cooked to a soft perfection and sautéed in a sweet Asian sauce. While skeptical at first about eggs and peanuts in this dish, they gave it a salty twist that kept the sweet sauce from overpowering the meal. These chefs definitely know what they are doing. Overall a great lunch on Calle Ocho. I would recommend to anyone who likes Japanese and Thai cuisine to come to this place and give it a try. It is guaranteed that whatever you order in this restaurant will be both original and delicious. I hoped you enjoyed the post and thanks for stopping by! To all of my followers, thank you for your support. It means the world to me when I see you guys liking my posts and keeping up with my writing. If you ever have an opinion on what restaurant I should try next then please leave a comment and let me know. Happy Monday everyone. Located in Downtown Dadeland, this Gastro pub has earned the title of best croquetta’s in town! Recommended to us by our good friend Kelci, Barley and Swine is a new spot that serves up its own brand of American Comfort food. With Latin and Asian flavors fused into every dish, this spot is great for trying things with a twist. Jessica and I had a great time at this restaurant and this is what we ordered. 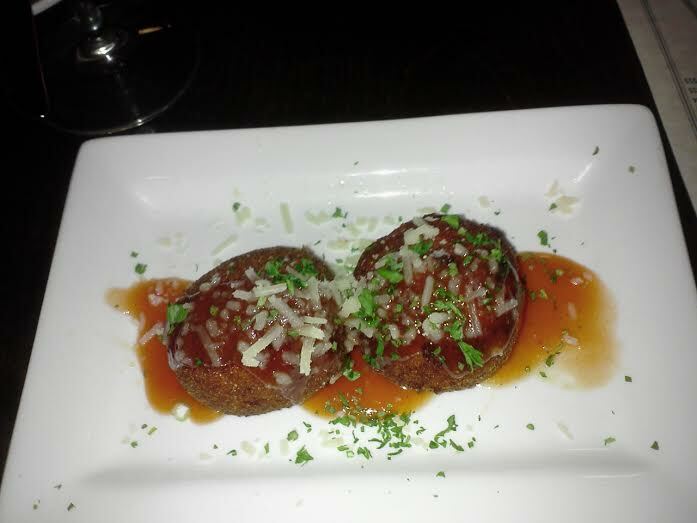 Croquetta’s – serrano ham, manchego cheese, guava sauce and parmesan cheese. Hands down, best Croquetta’s I’ve ever had. Each bite was both pure joy and pure sadness. Pure joy because of its perfect combination of flavors and pure sadness because of its ability to disappear so quickly. I highly recommend these to anyone who’s willing to step outside of their comfort zone. You won’t regret it. 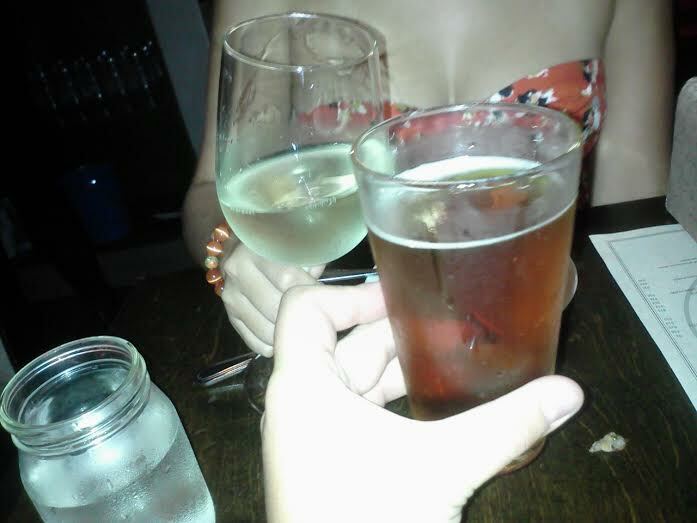 Beer – American Bourbon Ale and Wine – House white wine. Being a gastro pub, a large selection of beers could always be expected. This one in particular was delicious. Jessica got the house white wine which came chilled and was great too. 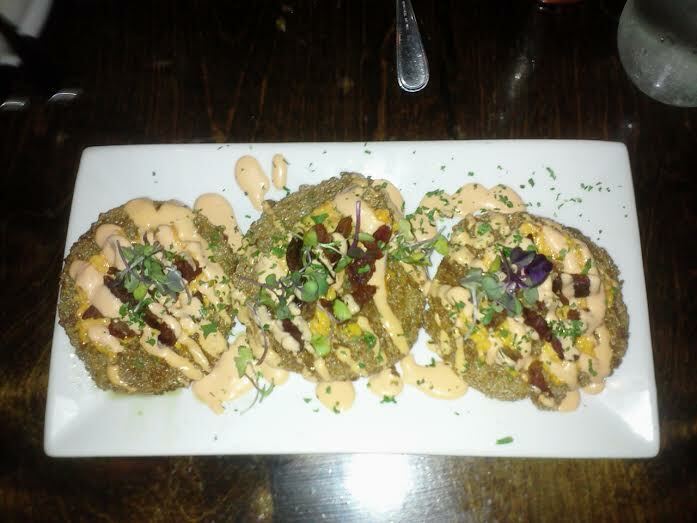 Fried Green Tomatoes – pimiento cheese, crispy bacon and pimiento aioli. 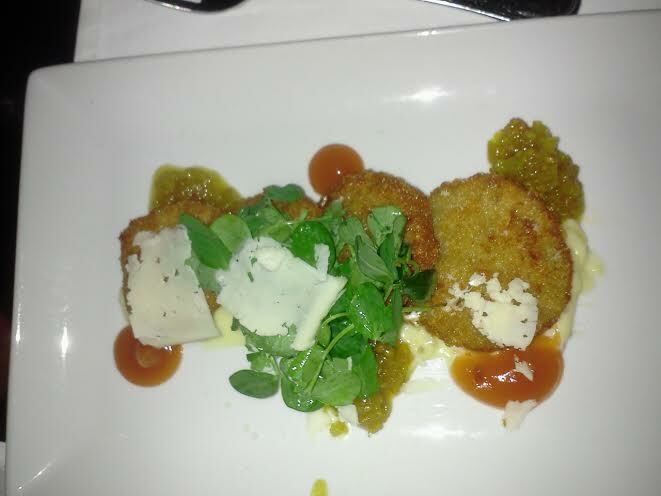 The presentation of these fried green tomatoes was unfortunately better than their actual taste. While the pimiento aioli was a great addition to the fried green tomatoes, the breading was too thick. This resulted in a mushy tomato with a crunchy exterior which was not terrible, but I wouldn’t order it again. House Mac & Cheese – large shell pasta – house blended cheese. Wow. I mean Wow. I don’t think I’ll ever be able to enjoy Mac & Cheese from anywhere else ever again. 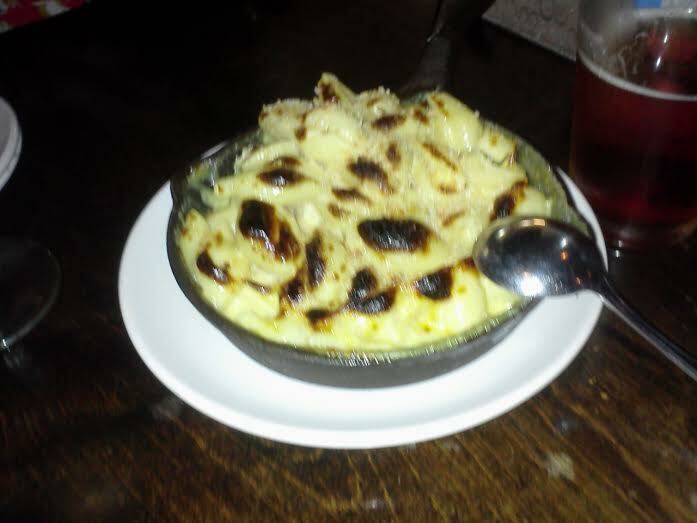 This dish of Mac & Cheese is served in the same cast iron skillet that it is cooked in. While in the picture you may think that the tops of the shells were charred and burnt, you would be incorrect. Those seemingly burnt shells were just as good as the ones on the bottom making this dish an absolute winner in my book. I highly recommend this one to all food lovers as well. Barley and Swine is definitely a great place to try both new and classic dishes. I will be coming back for an order of those Croquetta’s and I may stay for another Mac & Cheese when I do. Thanks for stopping by! The Queso Fondue. 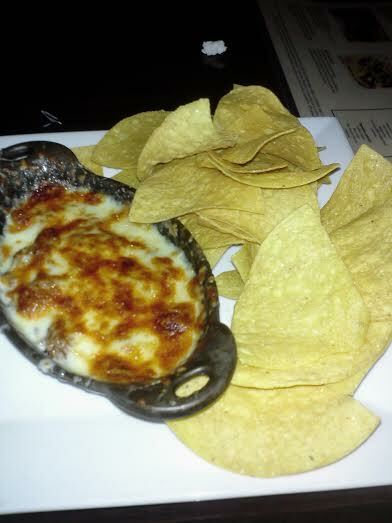 A blend of 3 cheeses and Mexican chorizo, melted and served with fresh tortilla chips. This is a must have if you’re planning on ordering an appetizer. This mouthwatering treat is served in the same cast iron skillet that it’s cooked in, giving the Fondue a truly great flavor. 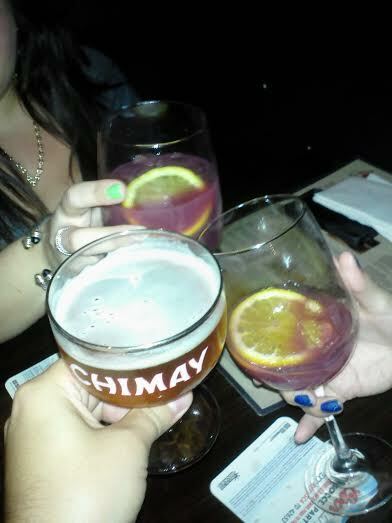 Sangria and Chimay beer. Known for giving everything an unexpected twist, Latin House makes their own special version of Sangria that’s perfect for Miami weather. I went with one of my favorite beers called Chimay which never disappoints. The Chimi Burrito and the Grilled Chimi Burrito. Normally Jessica goes with the “MadLove” burger but after trying my Chimi Burrito last time, I can’t blame her for ordering one this time around. Since they’re basically the same I’ll just tell you about the regular Chimi Burrito that I can’t seem to get enough of. 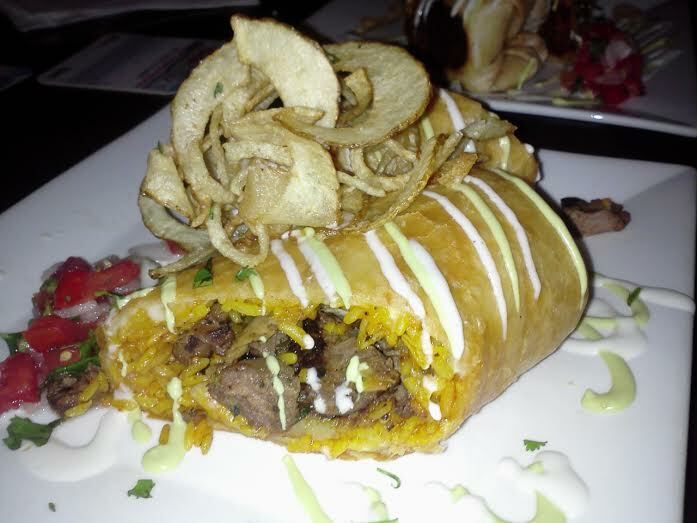 Yellow “Chuchi” rice, three cheeses, sweet plantains and carne asada come wrapped in a large flour tortilla that is flash fried and topped with pico de gallo, avocado lime sauce and Mexican crema. In short, this is the holy grail of burritos. If you’re the type of person that likes going to a restaurant and ordering the dish that made them famous, then make sure you order one of these. I could literally write an essay explaining why this burrito is the greatest invention ever created but I rather you just try it for yourself. Timba. 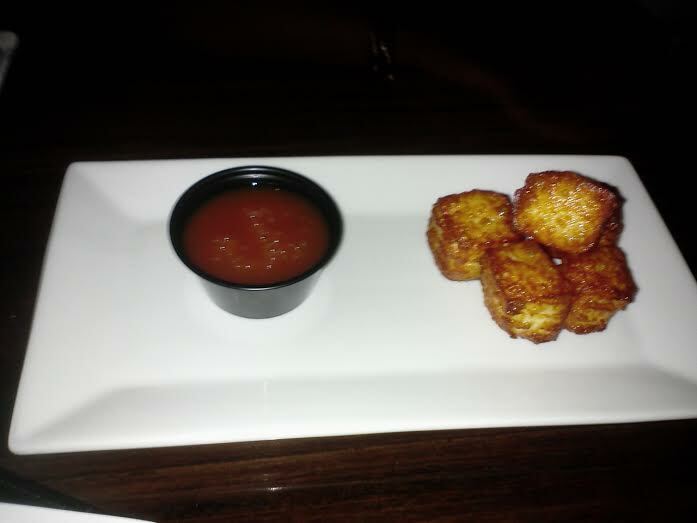 Fried Cheese Cubes and a special Guava dipping sauce. The only negative thing that I have to say about this dessert is that it doesn’t come with more! I’m not really a desert person per say but when it comes to Timba, that doesn’t really apply. Crispy on the outside and soft on the inside, these cheese cubes go perfect with the special Guava dipping sauce. I highly recommend that all food lovers give Latin House a shot. Great service and amazing food keep me going to this restaurant time after time. I hope you enjoyed the post and thanks for stopping by! First order of business is always ordering a drink. 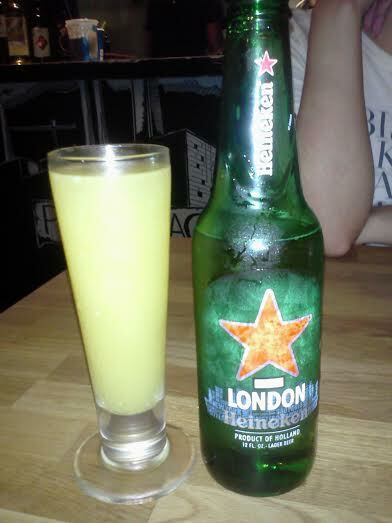 I went with an ice cold Heineken (Right) and Jessica went with a fresh Mimosa (Left). Who says Mimosas are only for brunch. We enjoyed both drinks. 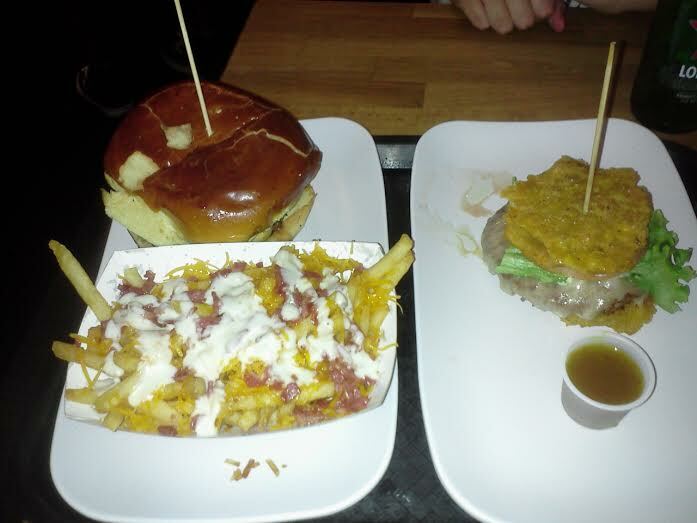 Next comes the Pincho Burger and Bacon Cheddar French Fries (Left). Obviously this isn’t a meal that I would recommend anyone eat often, but when you feel like taking a break from the healthy stuff this sure does hit the spot. 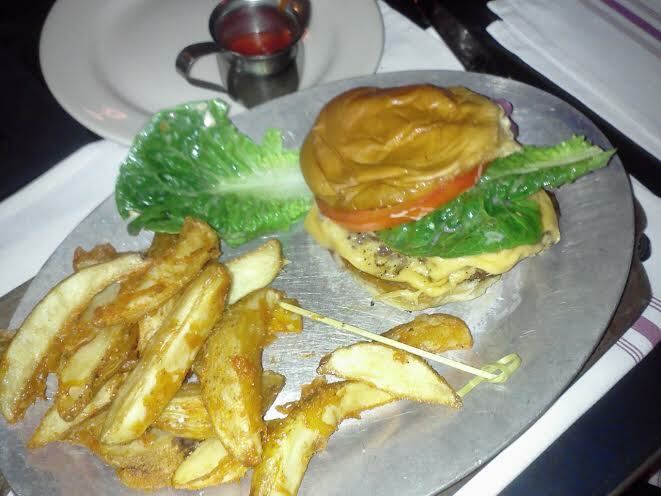 The Pincho Burger was cooked to juicy perfection with lettuce, tomato, potato sticks and their special sauce. The Bacon Cheddar fries came with a ranch dressing on top. Each bite was both delicious and depressing. Delicious in taste but depressing in that I could tell it was a calorie bomb. 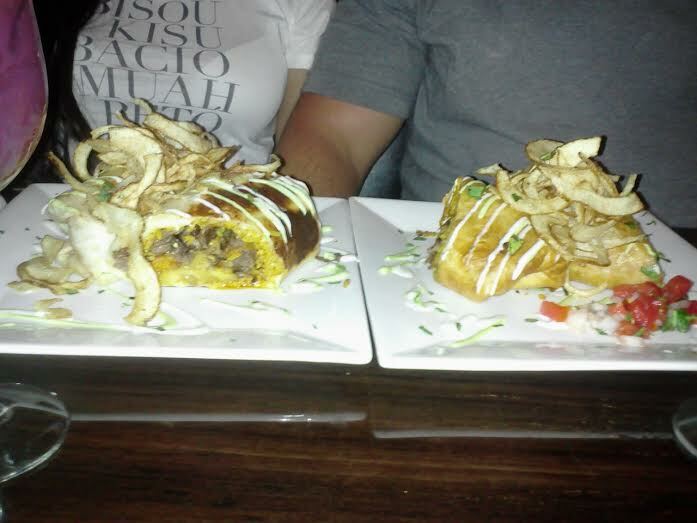 Another and perhaps more renowned dish is the Toston Burger (Right) which Jessica ordered. Sandwiched between two tostones (fried plantains) comes a well-cooked burger with jack cheese, lettuce, tomato and a homemade cilantro sauce. If I return to the Pincho Factory I might consider ordering that burger instead. With the innovative toston buns and that amazing cilantro sauce, this burger is in a category of its own. Keep in mind though that the burger is super filling and likely to be too much for one person. Jessica could attest to that. Desert ended up being a second round for us. After such a filling meal, it was all that we could bare. My favorite part of our dinner was honestly the bill. Great prices and really unique food are always a great combination. For anyone thinking of going to the Pincho Factory I would strongly recommend doing so on a day that you’re starving. 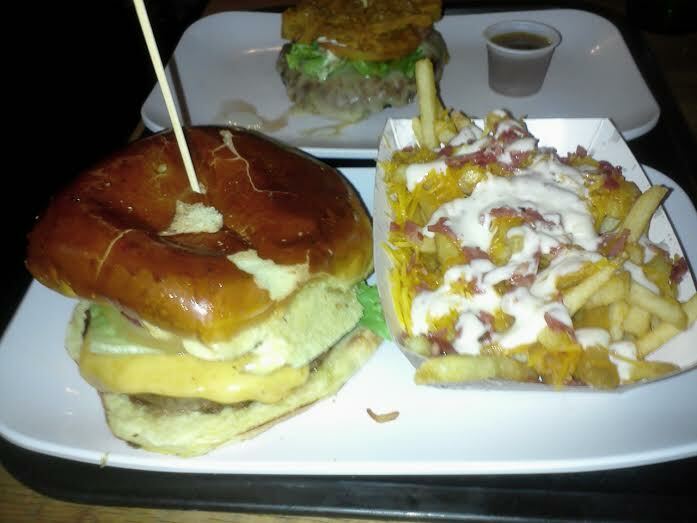 The burgers are very heavy and a side of bacon cheddar fries might put you in a food coma. Aside from that, I really enjoyed our dinner and plan on trying their Pincho’s next time. Thanks for stopping by! Miami is a great place to try new restaurants and experiment with different foods. Recently there has been a Gastro-Pub revolution in the Miami area. With a more intimate vibe, unique drinks and menus that reflect a Chef’s creativity, they are all the rave. This is why we chose to go to Miracle Mile in Miami, an area that’s known for its shopping, bars and most of all its trending restaurants. Saturday, Jessica and I went to a relatively new Gastro-Pub named Swine. Here’s what we had. Fried Green Tomatoes. These delicious little green tomatoes won us over from the first bite. The flavors were so fresh and Earthy that we almost ordered seconds and ditched our meals. Ingredients: FL Tomme, pea shoots and tomato chow chow. I don’t quite know what those things are by themselves, but together I know that they are the best fried green tomatoes I have ever had! Orkney Skull Splitter Ale and the Homestead Bound. 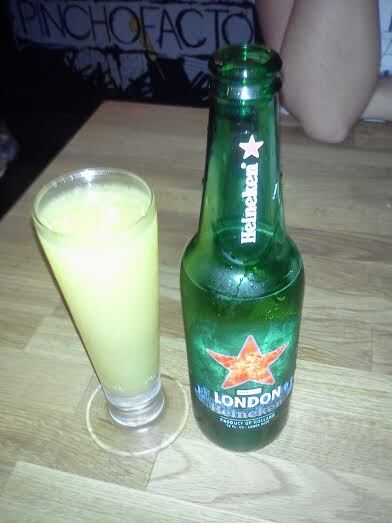 Probably the most creative and refreshing drink I have ever had in my life, of course ordered by Jessica. 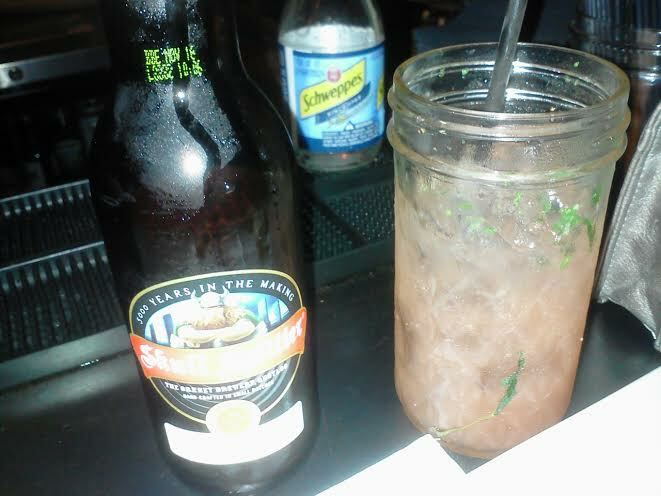 The Homestead Bound ingredients: Absolut Vodka, Veev Acai, fresh strawberries, orange, lemon basil and mint. This delightful amalgamation of fresh ingredients and properly mixed alcohol is a game changer to say the least. I will definitely order that again when I return. The beer that I ordered was really great too, packed with rich complex flavor that anyone should expect from a good ale. The Swine Burger. Ingredients: Short-rib, brisket and smoked pork blend, homemade dill pickle, thick-cut house smoked bacon, lettuce, tomato, American cheese and Swine’s special sauce. The burger was a great choice as all of the ingredients could be savored individually and no single ingredient overpowered another. The lettuce and tomato was fresh, the bacon was crispy and the meat was cooked to perfection. Cookies and Milk. Ingredients: White chocolate stuffed homemade Oreos, ice-cold bourbon spiked milk and a dark chocolate dipping sauce. I should say that I’m lucky to have Jessica by my side because if not for her then I would have never tried this desert. 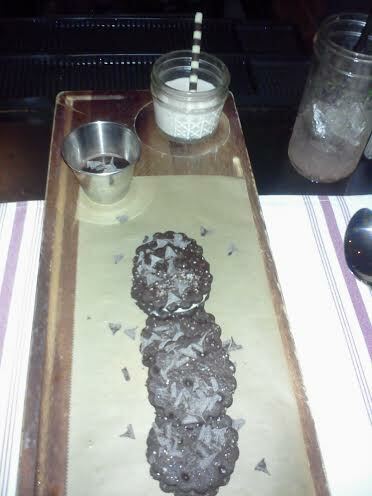 The cookies and dipping sauce were warm and the spiked milk was super cold. Every bite was just as delicious as the last leaving you wanting more. Initially skeptical about the spiced milk, we were shocked to find that the subtle hint of bourbon gave the milk just the right amount of flavor to make it perfect. For those of you who are looking for a restaurant with a unique personality and a world class chef, go to Swine. This Gastro-Pub nestled in Miracle Mile Miami is my new favorite restaurant hands down. A relaxed ambiance with dim lighting and creative décor make this restaurant everything that a Gastro-Pub should be. We had great service and we could tell that the staff was as excited about the food as we were. We felt like we were among friends who wanted us to enjoy this experience with them. Swine is a definite winner in my book and I recommend the spot to anyone who is willing to try something new. Thanks for stopping by.